R. Samuel ben Meir (b. 1085) wrote his Torah commentary at a point in time when the French masters of Bible collected their glossae, but he wrote it also at the point in time that we today consider to be the turning point in 'lay literacy, ' when the Anglo-Norman aristocracy patronized the production of romances. In the first half of the 12th century, Northern France was a vibrant spot. It was an era in which composing, reading, and listening to narratives and stories intensified as a complex cultural phenomenon. 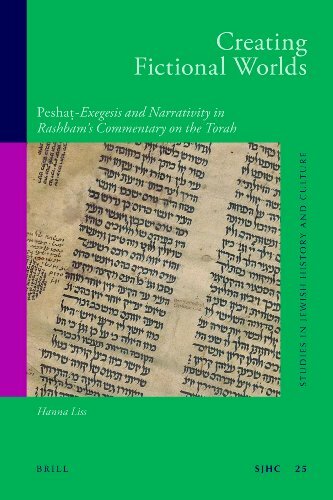 This book presents the idea that Rashbam tried to compete with this new intellectual movement, claiming that the literary quality of the biblical texts was at least as good as that of the nascent courtly romances, or even on a par with one another. Anselm Scrivener Books specializes in academic books in the following areas: Legal studies; American literature and history; Precolumbian, New World, and early America; late antiquity; Medieval and Renaissance studies; early modern European. All our books are key-worded to be readily searchable by topic. We are a five-star seller! Return within 14 days of receipt if not as described. Credit card orders are processed by Abebooks. We do not accept credit cards or personal checks directly. Contact us directly to purchase a book using PayPal or with cash. Cash payment may be sent at buyer's risk; none of our customers has had a cash payment sent to us lost in the mail. Contact: Anselm Scrivener, P.O. Box 17266, Chapel Hill, NC 27516-7266; anselms@hotmail.com. Standard and priority shipping by USPS only. Orders usually ship within 2 business days. Shipping costs are based on books weighing 2.2 LB, or 1 KG. If your book order is heavy or oversized, we may contact you to let you know extra shipping is required. INTERNATIONAL CUSTOMERS: please note that the U.S. postal service has now cancelled international surface rate shipping. Books going to international destinations from the U.S. must be sent by air mail. Address: Chapel Hill, NC, U.S.A.